Sandra Kaye: Another UFO Bite's the Dust!!! YES!!!!! UFO #3 on my list is done!!!!! 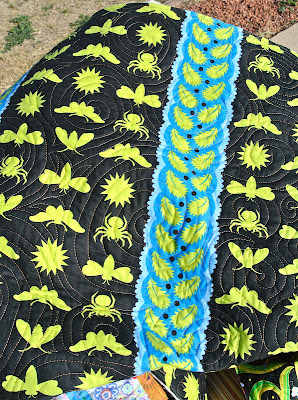 This calls for another happy dance :O) The front is made with Kaffe Fasset fabric. but...I don't think I did to hot of a job :( I was going for the really big spirals you see sometimes on quilts...not so easy to do on a little Bernina. Those quilts were probably done on long arms. Very shaky. Oh well, lesson learned! Here is our Penny-pug!! She was NOT leaving her sun spot!! But, she was happy to share it for the photo. "I am NOT leaving my spot..but go and do what you need to do..I'm not moving!!" I think she is still out there. That girl loves the sun!! This quilt is so pretty! So happy it's done and not a UFO anymore! Just gorgeous!! That is a fantastic quilt! I love the fabrics and your machine quilting is really amazing. Your quilts are always so "happy". Have a great weekend as well! Great quilt!! And little Penny is so cute!!! 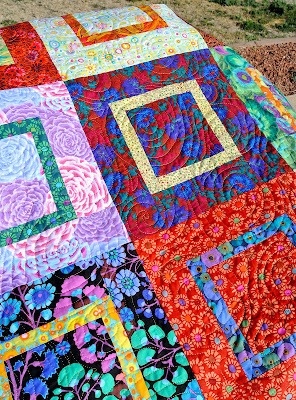 Beautiful colourful quilt Sandra. Love the quilting and the back is lovely too. So colourful! Just what I needed to brighten a dull,grey morning. Congrats on the finish. Your quilt is so bright and cheery! Okay, you have inspired me to get off the computer and get sewing. Love the swirls, you did great! Your quilts are always beautiful happy works of art. With great quilting.I think they are extra fantastic as I can't quilt.Oh I can cut and stitch the tops great.I can't get the hang of quilting,soon as I start it all puckers up.My aim this year is to master it.I usually just put a tack in the required distance apart. 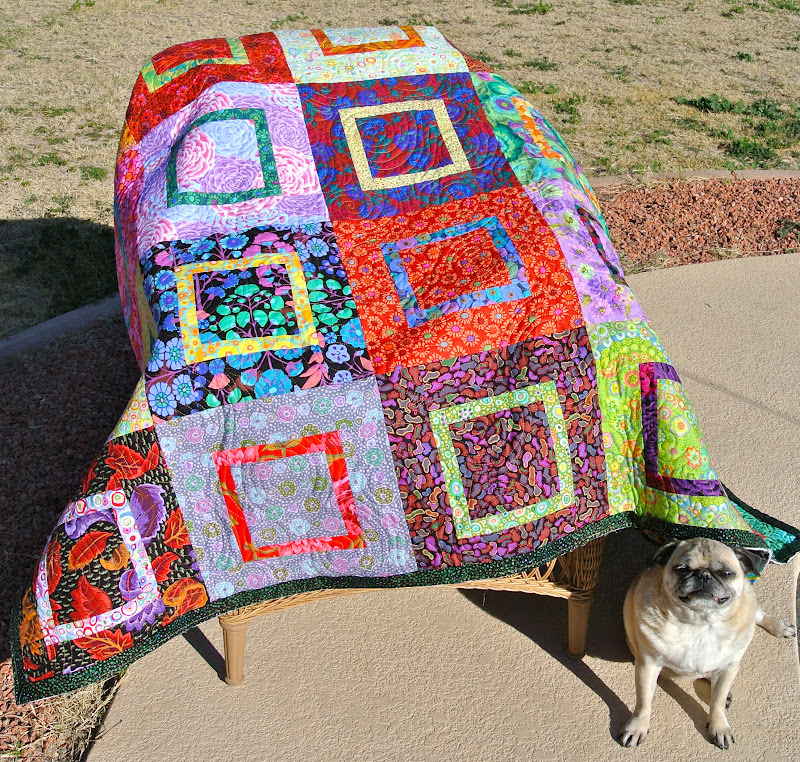 oh love it - gotta love that kaffe - and you've done a great job on the quilting - go you!! beee-YOU-teee-FULL quilt! I LUV the colors...are some of these fabrics Kaffe Fassett? That is such a wonderful quilt!! All those beautiful Kaffe fabrics work so well with that pattern. Your quilting looks awesome! I love big spirals! Penny Pug is such a cutie!! I love the image of her not giving up her spot in the sun!